Today’s post is a contribution to the 31 Days of Oscar Blogathon, hosted by three great gals, dedicated fans of classic movies. 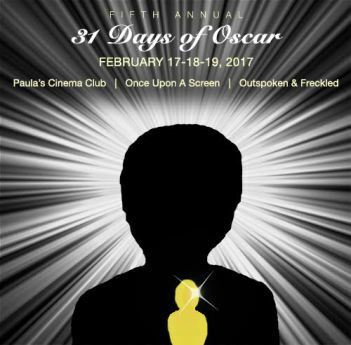 Please visit their sites to read other great posts covering all things Academy Awards: Once Upon a Screen, Outspoken and Freckled, and Paula’s Cinema Club. When I learned about the annual Oscar Blogathon, I knew I wanted to participate again. This time I decided to write about a specific Best Picture winner and I chose 1945’s The Lost Weekend. I scoured for an online source in order to re-watch it, but struck out with that source. I checked our Netflix and Amazon sites, via our Roku box, and again, struck out! The local Family Video store didn’t have it. I finally went to Rolla’s Public Library and bless them-they had the newest dvd of it!! I settled into our comfy tv room, popped that movie into the dvd and became mesmerized again by this bleakest of dramatic offerings. If you are not familiar with The Lost Weekend, it is a realistic look at an alchoholic and his horrific weekend, seeking out alchohol, and the broken relationships and self-harm he leaves in his wake. Hollywood, from early silent films until 1944, usually depicted an alchoholic character as a comedic, bumbling joke. However, in 1944, writer Charles Jackson wrote his first best-selling novel, The Lost Weekend, an autobiographical, unflinching look at the horrors of being an alchoholic. Jackson’s novel was published in early 1944 and that spring, director Billy Wilder was on a train trip from LA to NYC and while on a layover in Chicago, he bought Jackson’s novel. Wilder was so enthalled with the book that he stayed up all night reading the book, re-reading it, and taking notes. When Wilder arrived in NYC, he quickly contacted Paramount Production Head Buddy De Sylva, and told him that The Lost Weekend was to be Wilder’s next movie, so please quickly buy the rights! De Sylva had heard about the book and he had a lot of doubts that any movie about an alchoholic could be a financial success, but lucky for Wilder, the rights were purchased. Wilder set to work. His friend and collaborator Charles Brackett agreed to help write the screenplay and agreed to be the film’ s producer. Now to find the lead actor. Wilder was interested in having Jose Ferrer, currently getting raves on Broadway, to play the lead role of Don Birnum. De Sylva nixed that idea as Ferrer wasn’t that well-known. The scuttlebut in Hollywood was that any actor who agreed to play the lead would be committing career suicide. Wilder knew that that wouldn’t be the case and even said, “Not only did I know it was going to make a good picture, I also knew that the guy who was going to play the drunk was going to get the Academy Award!” In 1942, Wilder had been allowed to direct his first movie, a romance comedy, The Major and the Minor. The lead actor in that film, Ray Milland, had worked well with Wilder and so he was asked to consider the lead in The Lost Weekend. Milland gladly accepted the challenge that this role would provide his career. One tiny production problem popped up: Milland didn’t drink alchohol! He didn’t know what it was to be drunk or to be craving a drink. The actor turned to the author, Charles Jackson, for advice on the inner mind of the alchoholic, how to act drunk, and Milland also decided to stay for 24 hours at Bellevue Hospital, in NYC, in the drunk ward. He went incognito as a patient, and during the night, a new patient was ushered into the drunk ward. The patient was agitated and began howling and since he wouldn’t settle down, the staff had to come and try to restrain him. Milland decided he had had enough so he left the hospital during this commotion but forgot about grabbing his street clothes. A cop saw him as he exited Bellevue, still wearing the robe patients were given at that time to wear, and the cop nabbed Milland and took him back inside the hospital! It took Milland a good chunk of his time to finally convince the officer and the hospital that he was really there just to do research for an upcoming movie role! Also, a few weeks prior to the film’s start date, Milland decided to go on a crash diet. He figured that an alcoholic probably doesn’t concern him or herself with eating 3 nutritious meals a day, so he lived on hard-boiled eggs, dry toast, grapefruit juice, and black coffee. Milland went from his normal weight of 168 lbs. down to 160 lbs. Katherine Hepburn was shown the script to possibly sign her on as Helen St. James, Don Birnum’s long-suffering girlfriend. Hepburn was intrigued by the script but was already preparing to shoot another movie and wasn’t going to be available to work on The Lost Weekend. Jean Arthur was then offered the role but she turned it down. That led to discussions, of hiring an ingenue, and Brackett contacted Jack Warner, head of Warner Brothers, about letting them borrow Jane Wyman. Warner agreed and Wyman got her chance to have her name above the title, and to also play in a more dramatic part then she had ever done before. Publicity still of Milland and Wyman. Rounding out the cast were the very capable Phillip Terry, as Wick Burnham, Don’s long-suffering brother, Howard Da Silva as Nat, the owner and bartender of Nat’s, Don’s favorite bar, Doris Dowling as Gloria, a flirt who hangs out at Nat’s and has a huge crush on Don, Frank Faylen as Bim, the male nurse who explains the reality of being an alcoholic to Don when he is at Bellevue. Lilian Fontaine(mom of Olivia de Haviland and Joan Fontaine) has a small part as Helen’s mom and Lewis L. Russell plays her father. William Newell also has a bit part as a liquor store owner whom Don robs for a quart of rye. Gordon Jennings is good as the opera house’s coat room clerk who won’t let Don search for his coat when he is handed Helen’s by mistake, and Douglas Spencer-better known as reporter Scotty in The Thing From Another World, is quite good as an alchoholic with a horrible case of the dt’s, sharing the drunk ward with Don. The Lost Weekend begins on a Thursday afternoon, with a wonderful opening shot of New York City, a long view of the tall buildings as they sweep by our eyes. It must be spring or fall, as we see apartment buildings with opened windows, curtains billowing in the breeze. We meet the characters that tell us the story of this weekend, which begins on a Thursday afternoon and ends on a Monday morning. There is Wick Burnham. the sensible brother, but he’s getting so very tired of trying to help his brother Don dry out. He lets Don share his apartment, but pays all of the rent, the utilities, pays for their food, because Don, who aspires to be a writer, has no job. Don’s girlfriend is Helen St. James. A sweet lady, who left behind a loving home in Toledo, Ohio to make her way in the exciting environs of NYC. Helen works at Time magazine and often is given tickets to the theatre or opera. We see in a flashback that the opera is where she met Don, over a mixing up of their coat check tickets. Helen is sweet, honest, tough, and not willing to give up on Don or the possible future they could have together. At Nat’s bar, we meet Nat. He’s a good-natured guy, but not one to push around. He sees the downward spiral Don is in and tries to counsel him to get help, especially since Don has that nice St. James lady who loves him. Also at Nat’s is Gloria. A very pretty gal, who is very attracted to Don and lets him know it. She doesn’t seem to understand that he is an alchoholic, and is ready to loan him some cash when he visits her apartment, desperate for money. It is here that Don has a horrible fall down a flight of stairs that lands him at Bellevue. Then there is Don, the main character of this story. Milland really gave a tour de force performance. We can see glimpses of the jovial and charming man that Don Birnum could be. We see the huge frustrations and desperation in his eyes when he can’t find anymore hidden bottles of liquor in the apartment, or when there isn’t anymore money to buy that quart of rye. We see his fear at waking up in Bellevue’s drunk ward, not knowing where he is at first and then being caustically lectured by Bim, the head male nurse, as to what he sees all the time in dealing with alcoholics. Echoing those horrors is Don’s own experience of the dt’s or delirious tremens, when he thinks he sees a mouse that has chewed a hole in the wall of the apartment, only to be attacked by a bat and blood running down the wall! Milland looks hagard, ill, is unshaven and sweats profusely. He staggers around NYC and in one scene, he practically cries out to some businessmen why are the pawn shops closed??? Don’t they realize he has to pawn his typewriter for money??? When he is told it’s because of Yom Kippur that the stores are closed, he looks devasted, like he’s lost his last friend and there won’t be anymore in his lifetime. Miklos Rozsa needs to also be mentioned due to his musical contributions to the score. When test audiences saw the film in California, they didn’t like it. Rozsa noticed that a jazzy, George Gershwin type of tone was being used in different scenes and he told Wilder that he thought musically that that was the wrong approach. Wilder told him to come up with another musical score and Rozsa did. He used the instrument, the theremin, whenever Don was having one of his alcoholic crises. That sound immediately gave the movie an other worldly feel, to symbolize that the alcoholic’s world isn’t normal. You can hear that sound for yourself in this clip from Youtube, the movie’s trailer. The theremin is apparent at the 23 second mark. After The Lost Weekend was seen by the American movie going public, and the movie viewers abroad, it cleaned up nicely in the awards categories for 1945. Billy Wilder and Ray Milland won Best Director and Best Actor, and the movie won Best Picture from the New York Film Critics Circle. Milland won Best Actor from the National Board of Review. At Cannes, Milland won Best Actor and Wilder won the Grand Prize. The Lost Weekend won the Golden Globe for Best Dramatic Film, Milland for Best Actor, and Wilder for Best Director. For the Academy Awards, The Lost Weekend had garnered 7 nominations: Best Picture, Best Director, Best Actor, Best Writing(screenplay), Cinematography, Music, and Editing. It won 4 Oscars: Best Actor, Best Director, Best Writing, and Best Picture. Since Wilder had also co-written the screenplay, he actually won two Oscars for The Lost Weekend. As Milland took the stage to accept his award, emcee Bob Hope joked that Milland’s Oscar was hidden away in a ceiling light, as that was one place Don Birnum had hidden a liquor bottle in the film! If you have never seen The Lost Weekend, do find it and view it. It really is a remarkable feat in the motion picture arts and was added in 2011 to the National Film Preservation Board. Credited articles that helped in the writing of this blog topic: “Weekend in the Sun”, Bailey, Blake. March, 2013, Vanity Fair. “Why The Lost Weekend is Essential”, McGee, Scott. Turner Classic Movies website. Ginger Rogers had enjoyed a successful film career that began in 1929, but it really took off in 1933, when she teamed up with dancer Fred Astaire. Ginger and Fred made 9 musical films together, from 1933-39, and all proved to be box office hits. By 1940, Astaire and Rogers wanted to make other movies, so the partnership broke up(though they did reunite for 1949’s The Barkley’s of Broadway) and Ginger moved on, starring in various comedic and dramatic roles. In 1940, she starred in the film, Kitty Foyle, and for her performance, won the Best Actress Oscar at 1941’s Academy Awards. Her award-winning role is my classic movie pick for today. Kitty Foyle began as a book, written by Christopher Morley, in 1939. It was a best-seller, and so often happens with best-selling books, Hollywood came calling. RKO Studios bought the rights to Morley’s book and made the movie version. Sam Wood was chosen to direct and Millard Kaufman wrote the screenplay. Ginger was chosen to play Kitty, and the two leading men for the film were Dennis Morgan and James Craig. Supporting cast included: Eduardo Cianelli, Ernest Cossart, Gladys Cooper, and Odette Myrtil. Ginger(who let her natural reddish-brown hair color come through for the role) is outstanding as Kitty. As the film opens, we meet Kitty Foyle, a pretty, smart businesswoman who is an executive at Delphine Detaille’s Fashion House. Kitty is deep in thought as she has to make a choice. Marry Dr. Mark Eisen or stay unattached so that her former love and husband, the wealthy Wyn Strafford, can sweep into her life yet again. We then see Kitty’s life in a flashback. Kitty is a poor girl, growing up in Philadelphia, raised by her widower father(Cossart). She is always daydreaming about living a life of wealth, more of a Cinderella-type dream where a rich, handsome, young man will swoop in and be her Prince Charming. Her dad, whom she affectionately calls Pops, warns her to stop the daydreaming and wake up to reality. One day, however, she does meet her Prince Charming, Wynnewood Strafford VI played charmingly by Dennis Morgan. It’s love at first sight! Wyn wants to be a businessman in his own right and doesn’t want to join in the family’s banking business. He has begun a magazine and after he meets Kitty, he hires her to be the secretary for his new venture. Love blooms between Wyn and Kitty. When the magazine fails, Wyn’s weak side shines through as he goes back to his family and enters the banking business, and refuses to ask Kitty to marry him because he’s afraid of what his family will say about his wanting to marry a girl not from their same social standing. Kitty’s father passes away and she is off to New York to seek a new life. She gets a job at Delphine’s (Odette Myrtil) fashionable shop for ladies. While at the shop one day, Kitty accidentally sets off the store’s burglar alarm and pretends to faint to hide her error. A doctor is summoned and he has a “meet cute” moment with Kitty. He is Dr. Mark Eisen(James Craig) who teases Kitty into going out on a date with him and she agrees to the date. After seeing Mark quite a lot, Kitty begins to have fond feelings for him, but then Wyn reappears, in NYC! He finds Kitty and begs her to marry him, that he is desperately in love with her! What’s a girl to do? Kitty going on a case with Dr. Mark! Wedding bells ring, and Wyn and Kitty marry, agreeing that the only way their marriage will last is if they don’t live in Philadelphia. They decide to settle in NYC. Wyn also decides that he needs to introduce Kitty to his family. During their visit to the family estate, Kitty is treated very coldly, especially by Wyn’s mother(wonderful British actress Gladys Cooper, who was often called upon to play imperious mothers or mother-in-laws!) and Kitty learns that unless Wyn joins in the banking business in Philadelphia, he will be disinherited and will be left penniless. Kitty can see that Wyn won’t be able to stand up to the threat of losing all his money, so she quietly goes back to NYC alone and files for an annullment. Back in NYC, Kitty is back at her job with Delphine and life is going on when Kitty discovers that she is pregnant! Before Kitty can tell Wyn about their baby, she finds out in a society section of the NY Times that Wyn is engaged to a girl from a prominent Philadelphia family! More troubles come Kitty’s way, but she does have her steady work at Delphine’s, and that brings the audience back to Kitty at the film’s beginning. Whom will she choose? Wyn or Dr. Mark? I don’t want to reveal the movie’s ending as I want you, the readers of this blog, to seek it out! From time to time it airs on TCM(Turner’s Classic Movies cable channel) but it isn’t on the list for the remaining days of February. The film is available in a dvd for sale at TCM’s Shop. It is available to buy via Amazon or to watch it through their instant rent program. Lastly, a kind soul put various trailers of it on Youtube. By trailers, I mean an advertisement for the movie, that audiences in 1940 would have seen at movie theatres. Kitty Foyle is a lovely film. It’s charming, romantic, sad at times, with Ginger Rogers never hitting a wrong note in her portrayal of such a strong, sensible character. It’s no wonder she won the Oscar for Best Actress for her portrayal. As a former teacher, I am a complete and utter sucker/fan of movies that revolve around a teacher trying to save the world by getting through to their unruly, bratty, world of crime-leaning students. In 1954, writer Evan Hunter wrote a novel, The Blackboard Jungle, that got a lot of buzz from the reading public and it caught the attention of Hollywood. Movie Studio MGM bought the rights of the novel and Richard Brooks, not only directed the film, The Blackboard Jungle, he also wrote the screenplay. The movie did exceedingly well at the box office and it also was nominated in 4 categories at the 1956 Academy Awards: Best Screenplay, Best Editing, Best Art Direction, and Best Cinematography. The movie opens with that famous song that was used 20 some years later as the opener for the ABC sitcom Happy Days, Rock Around the Clock, performed by Bill Haley and His Comets. We then meet our protagonist, Richard Dadier(Glenn Ford), a WWII veteran who went to college on the GI Bill and earned a degree to teach English. He arrives at his very first teaching job, at North Manual High, an all-boys high school in inner city New York. Dadier soon learns that there are a lot of discipline problems at this school and that many of the students are juvenile delinquints. Still, he is optimistic that with his hard work and encouragement, his students will learn and will go on to success in life. His students, which most of the focus of the film is on one of his classes, were portrayed by some of the best up and coming actors of the 1950s and 1960s: Sidney Poitier as Gregory Miller, Vic Morrow as Artie West, Dan Terranova as Belazi, Rafael Campos as Pete Morales, Jamie Farr(cast credits list him as Jameel Farah) as Santini, and Paul Mazursky as Emmanuel Stoker. The faculty and staff of North Manuel: Louis Calhern as Mr. Murdock, Margaret Hayes as Miss Hammond, John Hoyt as Principal Warnecke,Richard Kiley as Mr. Edwards, and Emile Meyer as Mr. Halloran. Rounding out Didier’s life is his sweet wife, Anne, played by Anne Francis, and a former professor he seeks out for advice, Prof. A.R.Kraal, played by Basil Ruysdael. Dadier soon realizes his work will be tough when an object is thrown at the blackboard while he writing his last name on the board and explaining to his students how to pronounce his name. When Miss Hammond, who is a very stylish new teacher, is cornered after school in the library and about to be assaulted by a student, Dadier luckily happens to be walking by and hears her cries for help. Dadier rushes in and saves Miss Hammond and rightly gets some punches thrown at the student before he runs away. Later, Dadier and Mr. Edwards, a new math teacher who loves jazz, visit a bar after work one day, have a few drinks, and then on their walk to their apartments, a gang of hoodlums who attend North Manuel recognize their teachers and brutally mug them. When Dadier’s wife sees his beaten face at his arrival home, she insists that he give up this job and teach at a different school, one in a much better neighborhood or community. A side plot is that Anne is expecting and she’s worried about this pregnancy as she miscarried their first baby. It doesn’t help Anne’s stress levels when she begins to get horrible phone calls implying that her husband is cheating on her! Dadier hangs in there, and he is able to appeal to Greg Miller, to show Miller that he has natural leadership qualities. When Miller states that because he’s black and that there’s not a lot he can do as many doors will be shut to him due to his race, but Dadier doesn’t accept that reasoning and tells Miller that blacks can succeed in the modern world and that there are teachers who care. He encourages Miller not to drop out, which he had been considering. Artie West, as Dadier discovers, is one of the main bullies of the school, and a gang leader. Shortly after West destroys math teacher Edwards jazz record collection in the classroom, Dadier decides enough is enough and there is a climactic confrontation in Dadier’s English class between him and West. See this film for the performances: Glenn Ford, always a capable and sincere actor, shines here as the new teacher who wants to impact his students for good. Vic Morrow is excellent as the evil Artie and Sidney Poitier believable as Greg Miller, learning that he can succeed and that he does have leadership skills. Great supporting performances by Louis Calhern, Anne Francis, and Richard Kiley. The Blackboard Jungle will air on Turner Classic Movies on Valentine’s Day, Feb. 14th, at 2:45 am est/1:45 am cst, so set that dvr! The film is available to buy or instantly rent through Amazon. Over on Youtube, someone has put the main scenes of Blackboard Jungle together in a montage set to the film’s iconic opening song, Rock Around the Clock. Here’s that cool montage. Also on Youtube, is this charming interview with actor Jamie Farr, more famously known as Cpl. Klinger on the hit tv series Mash, about being in the movie Blackboard Jungle. Hey, Madison Avenue, Lighten Up!! From 1955-65, famed filmmaker Alfred Hitchcock hosted an anthology television show. At the beginning of each show, he’d give a preview of the drama about to unfold, and then he’d make a biting, jokey jab at the slew of commercials that would soon air prior to the drama. I think that many of the Superbowl ads from Sunday night would have made Sir Alfred roll over in his grave! What was it that this year, the 49th Superbowl, American audiences saw ads that were sad, depressing, and just not the norm when compared to Superbowl ads of the past? I can recall many hilarious ads for Budweiser beer, snack foods, and myriads of other products but not as many hilarious ads were made this year. Did Madison Avenue decide to put on it’s PC hat this year and focus on social issues instead of using humor to just sell products for their clients? On to the examination! Downer Ads: The #1 downer ad, to me, was the one by Nationwide Insurance. Depicting a boy, age 8 or 9, smilingly going about his day and then informing us he won’t live to ride a bike because he died in an accidental death, then we saw images: an overflowing bathtub, a toppled over tv, spilled household cleaners that contain caustic chemicals. Did Nationwide even think for one moment that parents who had actually lost a child to an accidental death wouldn’t be watching the Superbowl? Did these parents need a reminder of that awful event that took their child’s life? As I read on a posted Twitter account about that ad, “Nationwide is not on your side!” Nationwide has since gotten so much negative backlash about this ad that they’ve had to issue a statement about it, trying to explain what points they were trying to get across. A second downer ad, and one I missed as I was in the kitchen and not viewing the tv, aired only in the St. Louis, MO tv market and was sponsord by the MO branch of National Council on Alchohol and Drug Abuse. It depicted a mom going into her college-age son’s bedroom only to find him dead from a heroin overdose!!! To many in the St. Louis market, that ad topped the downer Nationwide ad. The third downer ad, and again I only caught snippets of it, was about a race car driver dad who has a horrible accident as his family watches the race on tv. The driver survives and recovers, all an ad for Nissan. I’m guessing that Nissan was suggesting that if the race car driver were driving their brand of car, he’d be safer? Does Nissan even make race cars? I don’t know. Also, this ad featured a poor song choice, Harry Chapin’s hit song from the 1970s, “Cat’s in the Cradle”, since in real life, Chapin died at the age of 38 in a car crash! The fourth downer ad was sponsored by the NFL, an ad against Abuse of Women. Again, I only caught glimpses of this ad, on my way to get a soda and only saw a messy looking bedroom, and missed the ad’s point. I guess this ad isn’t much of a surprise as the NFL has had to deal with players this season not treating the women in their romantic lives well, and an ad depicting the NFL against brutish treatment of women has to happen to keep the NFL’s image from being tarnished. There were some weird ads, namely the one for Squarespace with actor Jeff Bridges sitting beside a sleeping couple’s bed, intoning weird chant-like sounds as he rubs a stick over the rim of a decorative, metal bowl. Kim Kardashian’s ad for T-Mobile and the Skittles ad-funny, but weird. Lastly, there was the awkward McDonald’s ad, stating that starting soon, across America(Europe and Asia, you’re safe! ), random customers will have to perform an act of kindess or do a dance or sing a song, and if they do so, their order of food or drink is free. As someone at the Superbowl party I attended said, this new push by McDonald’s could go horribly wrong. Polling my kids and myself, we thought the following were the best Superbowl ads and I’m just listing them in a random order, not trying to say one was better than the others: Snickers ad using old Brady Bunch episode clip when Marsha gets hit in the nose with a football, Danny Trejo as Marsha, and the icing on the cake, Steve Buscemi as Jan. Esurance ad depicting Breaking Bad character Walter White(Bryan Cranston) working as a pharmacist-I only wish they could have somehow gotten Jesse(Aaron Paul) to be in it as his pharmacy tech! Anheuser-Busch’s ad, heart-warming; depicting the lost puppy being saved from a wolf attack by a team of the famous Clydesdale horses. Doritos ad, where an airline passenger does a lot of disgusting things in his seat to make sure no one sits next to him on the flight, but when he sees a pretty lady, he flashes his smile and a bag of Doritos tortilla chips, and then discovers that the pretty lady is a mommy with a young child in tow. Clash of Clans with Liam Neeson acting all tough, and playing his “Father who will get his revenge” character. Since I’ve been rewatching the 1980s hit tv show, Remington Steel, I liked the Kia ad featuring Pierce Brosnan. The BMW ad featuring a news clip from an old Today Show segment with Katie Couric and Bryant Gumble, not understanding what the internet is or will be, to their current situation, not understanding all the bells and whistles on the new BMW was very clever. Nationwide did redeem itself a bit with their funny ad of actress Mindy Kaling walking around NYC, thinking she’s invisible, but when she tries to randomly kiss actor Matt Damon, who is having lunch with some friends, she learns she’s not invisible. Lastly, Loctite won me over with their funny and goofy ad proclaiming the wonders of their glue! The ad even stated that it saved a marriage! The next time I need a stronger glue, I’m buying Loctite! In conclusion of my and my family’s analysis of the ads, please, please, please Madison Avenue, lighten up and stop the depressing, downer ads! We Americans want humorous ads to go with our Superbowl, heart-warming is great, too, but please, no more heroin overdoses or dead kids!! !